This review originally ran in Shelf Awareness for Readers. Naturally, after my year of rediscovering running (not dangerously), I leapt at the opportunity to pick it up. CNN correspondent Tom Foreman used to run marathons--in his 20s. One day, as Foreman was contemplating blowing out 51 candles on his next birthday cake, his eldest daughter (then 18) asked him to run a marathon with her. Little did he know that simple request would rekindle a long-lost love of running, leading him to run not only that one marathon with his daughter but also five half marathons, two additional full marathons and a 55-mile ultra-marathon, all over the course of a year. My Year of Running Dangerously is Foreman's humorous and heartfelt memoir of this experience. Starting with the earliest, shortest training runs with his daughter and moving through to the grueling 20- and 30-mile trails he ran in preparation for his ultra race, Foreman recounts his training days with a charming candor. Though much of Foreman's writing naturally covers the sport of running--shoes, gear, nutrition, common injuries, training plans--the majority of his reflections center on the experience of running versus the technique of it. In Foreman's case, the running experience led to a stronger connection with his eldest daughter, a better understanding of his relationship with his younger daughter, a deepened relationship with his wife, and a belief in his own ability to reach his goals, no matter how unattainable they may seem. "Running," he writes as he attempts to explain his love of the sport, "puts me in touch with the moment, and reminds me how each one is rare and precious." 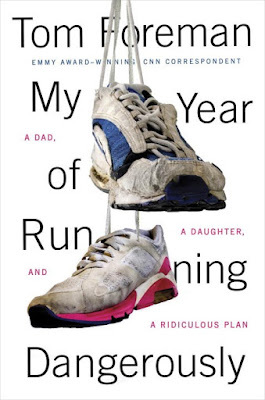 My Year of Running Dangerously will do the same thing for readers.